Derek Ham writes over at Barbeque Lovers about a solar-powered grill project he has been working on that uses latent heat storage to both extend cooking times, create hotter temperatures, and reduce the problem of intermittent sun. Based on technology developed by MIT professor David Wilson, the concept is expected to generate cooking temperatures of 450F, and offer up to 25 hours of cooking time. 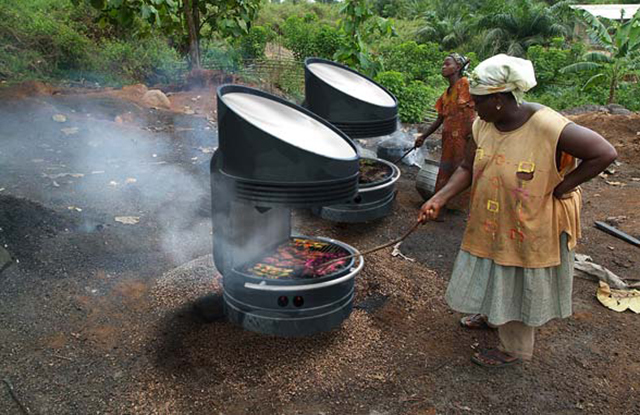 This study is very timely because although the students are creating a new grill for American backyards, the business plan is designed to allow the grills to be deployed in developing countries as an alternative source for cooking. Wilson originally came up for the idea during his time spent in Nigeria. While there he noticed a large set of problems linked to practice of cooking with firewood. Of course this design is unlikely to excite the purists who are addicted to the taste of hickory. But then with the American design expected to feature a hybrid solar/propane heating system, and with wood chips for propane grilling commonly available, there should be ways to get a little smoke in your food without the need to burn up the planet. The students are currently conducting an online survey to gauge the grilling habits of potential customers.